2010 Super Soaker Line by Hasbro Inc. :: :: iSoaker.com ::: iSoaker.com | Information | The Armoury :: Article Listing - 2010 Super Soaker Line by Hasbro Inc.
Get ready to get soaked! This year, Hasbro is combining two of its powerhouse sports action brands, SUPER SOAKER and NERF, to deliver the ultimate in water battles. Combining the legacy of SUPER SOAKER and the excitement of NERF, new, specially designed water blasters are available in either red or blue so you and your friends can divide and conquer during team-play or enter a one-on-one challenge to test your individual skills. When you’re in the heat of battle, you need a high-performance water blaster that will have your back; drench your friends with the power of NERF SUPER SOAKER water blasters! The biggest and baddest blaster in the new collection, the NERF SUPER SOAKER SHOT BLAST water blaster can drench your opponents from up to 25 feet away. All you need is a single pump to unleash a huge blast of water and soak them all! The customizable NERF SUPER SOAKER SHOT BLAST water blaster is compatible with the Tactical Rail System accessories and features adjustable and removable shoulder stock for maximum customization. Available in red or blue at most major toy retailers nationwide and on HasbroToyShop.com. Each sold separately. Need a bigger blast in a hurry? The new NERF SUPER SOAKER BOTTLE BLITZ water blaster gives you massive ammo capacity by allowing you to reload with ordinary soda or water bottles. Using pump-to-fire action, you can reign supreme and maintain a constant stream of awesome soakage. The NERF SUPER SOAKER BOTTLE BLITZ water blaster is compatible with most soda bottles. Always use clean tap water in your blasters. Available at most major toy retailers nationwide and on HasbroToyShop.com. The ultimate SUPER SOAKER faceoff has arrived! The new NERF SUPER SOAKER HYDRO FURY 2-Pack features two different colored HYDRO FURY water blasters, red and blue, so you can break into teams for competitive water play. The new team colors allow players to instantly recognize opponents and surprise them with a stealth shot. Available at most major toy retailers nationwide and on HasbroToyShop.com. Want to go the distance in your next SUPER SOAKER water battle? 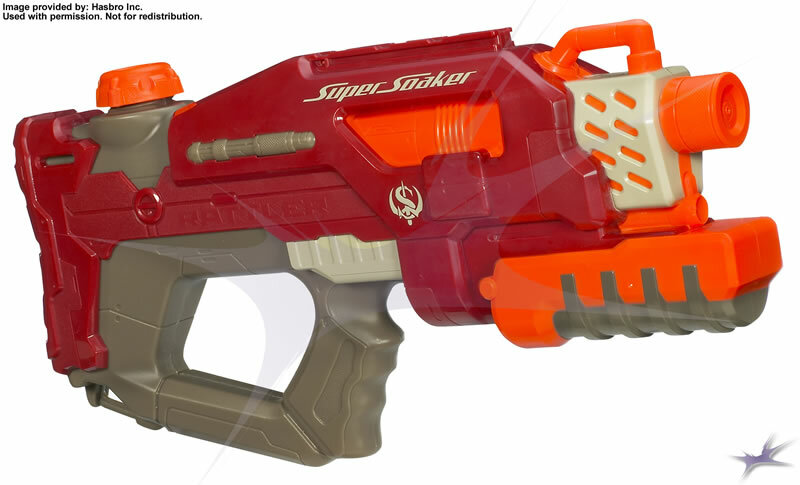 Look no further than the NERF SUPER SOAKER RATTLER water blaster. With a reach of up to 25 feet, this pump action water blaster will drench your opponents in seconds. Featuring NERF’s Tactical Rail System accessories, this customizable blaster allows players to be prepared for almost any faceoff. With its long lasting rapid fire blasts the NERF SUPER SOAKER RATTLER water blaster won't give your challenger a chance! Available in red and blue at most major toy retailers nationwide and on HasbroToyShop.com. Each sold separately.